What are the responsibilities of a Patient Care Specialist? Why become a Patient Care Specialist at Stone Academy? Patient Care Specialists are in high demand across the healthcare industry, especially as the population of the country ages and becomes more health conscious. While the course of study will include Nurse’s Aide classes that will provide students with the opportunity to gain their CNA certification, there are additional skills that will develop the student into a Patient Care Associate. These skills include training in phlebotomy, EKG, CPR, First Aid and the utilization of their hands-on skills in a home care setting. In addition to their hands-on training, students will gain non-clinical knowledge that will attribute to a more conscientious level of care from our graduates in the field. This includes dealing with people of different cultures and patients with specific diseases including dementia, Alzheimer’s, cancer and HIV/AIDS. 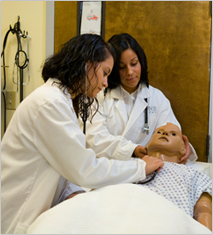 Students will also receive training in medical terminology, anatomy and physiology. Student’s training includes a clinical experience that allows them to the demonstrate skills acquired in class, in an active medical practice. Graduates earn a Home Health Aide Certificate and are eligible to sit for the State of Connecticut CNA certification exam. These credentials, along with the advanced PCS training, set our students apart from other applicants when entering the workforce. WHAT IS A PATIENT CARE SPECIALIST?